Lots of kids (and adults) think that dogs and puppies are pretty adorable. Big dogs, little dogs, quiet dogs, sleeping dogs, crazy dogs, some people love them all. If you and your kiddos are dog lovers, then these crafts are for you! Try one or more of these crafts on a rainy day, at a dog themed party, or just an afternoon with nothing on the schedule. They also make a cute gift for the dog lover in your life. If your kids know and love Clifford The Big Red Dog, this project is for them. Your kids can have their own big red dog by making this paper plate Clifford craft. It's super easy and super fun! Turn a paper plate into your own pet. 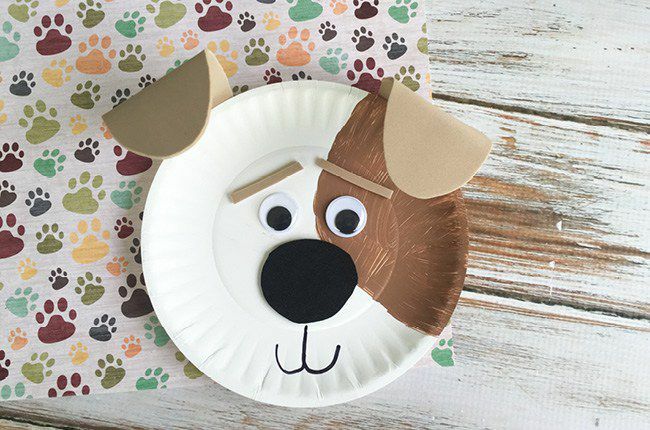 Use brown or tan paint, googly eyes, and construction paper to make this cute paper plate dog. Craft this sweet puppy puppet and take it for a walk through the neighborhood or make a few and put on a puppet show. Your kids will really enjoy this project. This is the easiest pet ever! No need to potty train or feed it. Just make your own shaggy dog from yarn and you've got a cuddly little friend to play with. Looking for a fast, frugal, and easy craft? Try this toilet paper roll dog craft. It's all of those things and more! Make a few so they can play together. Watch your crafty puppy get bigger and smaller with this paper spring dog project. Make it stretch across the floor for hours of fun playtime. How cute and delicious do these candy bar party pups look? They are really easy to make. With just a few pieces of candy, you've got one cute puppy dog! This idea would make great party favors or whimsical additions to a dessert platter or birthday party. Get a little messy with this footprint puppy craft. Who knew a child's footprint could be turned into such a cute dog? This puppy print craft also makes a cute card or keepsake for someone special in your life. Help your kids learn their shapes with this shape puppy craft. Different shapes put together can end up looking like a cute doggie. Use this puppy as a sweet card for any event. Did you know that you can make a tiny dog out of a single pipe cleaner? Choose any color pipe cleaner you want and start bending to make your very own pipe cleaner dog. Need a rainy day craft idea? This paper bag dog puppet project is just what you need! It's straightforward, fun, kid-approved and you probably have all the materials in your home. Make this cute puppy love-themed "I ruff you" dog craft as a Valentine's Day card, wall hanging, or just for fun! It is easy to make with just foam and googly eyes, so your kids will love putting this one together!